At our school we believe that a varied curriculum encourages emotional as well as academic growth and so we endeavour to make learning innovative and exciting for all our children. In order to promote personal development amongst our pupils, we work hard to foster an inclusive, caring and effective learning environment that helps children feel secure, valued and nurtured. We pride ourselves on our ability to instil a series of key values in our pupils, by creating an atmosphere of mutual trust and respect. Create a welcoming environment where everyone feels happy, safe and included. Instill a life-long love of learning and encourage pride in all achievements. Be an excellent school with high standards. Champion learning at the centre of our community. Enrich learning through exciting indoor and outdoor environments. Have passionate staff that will encourage a love of learning, evoke curiosity and stimulate imagination. Enable our children to achieve their potential and be prepared for the next stage of their education and adult life. Be guided by our key values; perseverance, kindness, respect, honesty and fairness. Make learning fun, challenging and satisfying, using a creative edge curriculum. Provide an encouraging atmosphere where children and staff can strive to achieve their best. Be a school strengthened by its support from parents and children alike. Encourage and support the development of staff and governors, in order to achieve the highest standards for all. 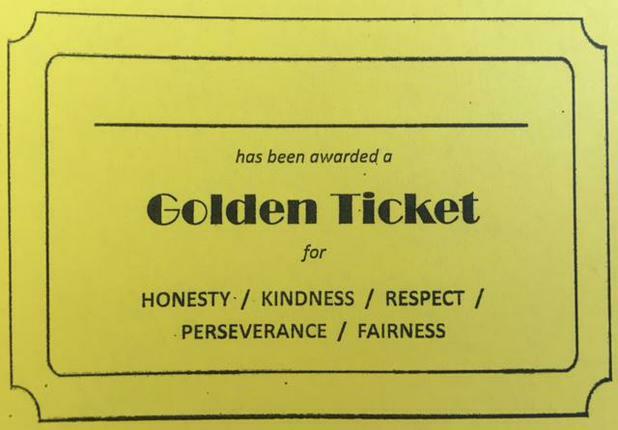 Children are awarded Golden Tickets if they are seen demonstrating one of our key values. During our Friday celebration assembly, 2 Golden Tickets are picked out at random and the children choose a prize.